As President of Synergy Gallery I had the honor of opening the Spectrum festival. It was both a happy and sad moment for me. I have been president at Synergy Gallery for some time now. We have a great board and have really turned the place around with exciting shows like Sight and Sound, merging music and performative painting with AV installations and many other great shows. 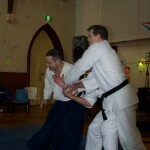 Unfortunately Synergy’s partnership with Northcote Uniting Church came to and end. After 10 years of collaboration it was time for a change. Synergy is moving to an as yet unknown new location. Many options are being looked into. In line with all this our Secretary Dani professionally known as Dandelion Jackson, (Saxophonist, musician, performer and painter) decided to organize the Spectrum festival. This is the beginning of a new festival concentrating on community art and sustainability. It was a wonderful day with many different vendors and artists combining to create a great atmosphere over 10 artists participated! The weather was bad but it didn’t dampen the festivities. 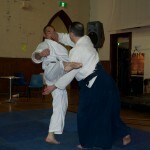 I performed with my Aikido dojo Pure Aikido. 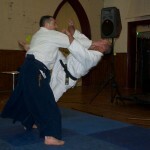 I did an Aikido demonstration and many of my students also gave outstanding performances. 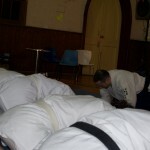 I view my Aikido practice as both performing, functional and often literary artform.